cents. The relevance of these results to peace, social and clinical psychology was discussed. ves, 2007; Herman, 1992; Bryant-Davis & Ocampo, 2005). of discrimination , see Pascoe & Richman, 2009). I. A. KIRA ET AL. al., 2006; Kira et al., 2012c; Kira, Fawzi, & Fawzi, 2012). stressors, such as the Hiroshima bombing and the holocaust. matization process and its cumulative dynamics. viduation process and emerged in adolescence and adulthood. tion mechanism (e.g., Kira, 2004; Kira, Fawzi, & Fawzi, 2012). ity being dependent on both chronicity and intensity of events. single episode (type I) (e.g., car accident) and complex traumas. of mental and physical health comorbid disorders. 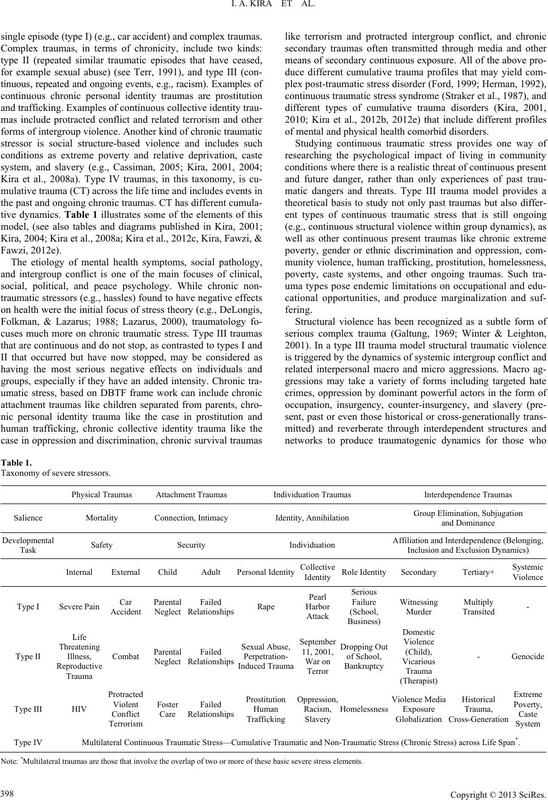 Type IV Multilateral Continuous Traumatic Stress—Cumulative Traumatic and Non-Traumatic Stress (Chronic Stress) across Life Span*. ote: *Multilateral traumas are those that involve the overlap of two or more of these basic severe stress elements. belong, identify with, or empathize with the targeted groups. cause annihilation anxiety (e.g., Kira et al., 2012a; Hurvith). ties (e.g., Gilman et al., 2001). chological well-being (Shonkoff, Boyce, & McEwen, 2009). crimination) may be particularly detrimental to adolescents. 2006; DuBois et al., 2002, Williams & Mohammed, 2009). tive identity (identity salience) (Hurvich, 2003; Kira, 2012a). 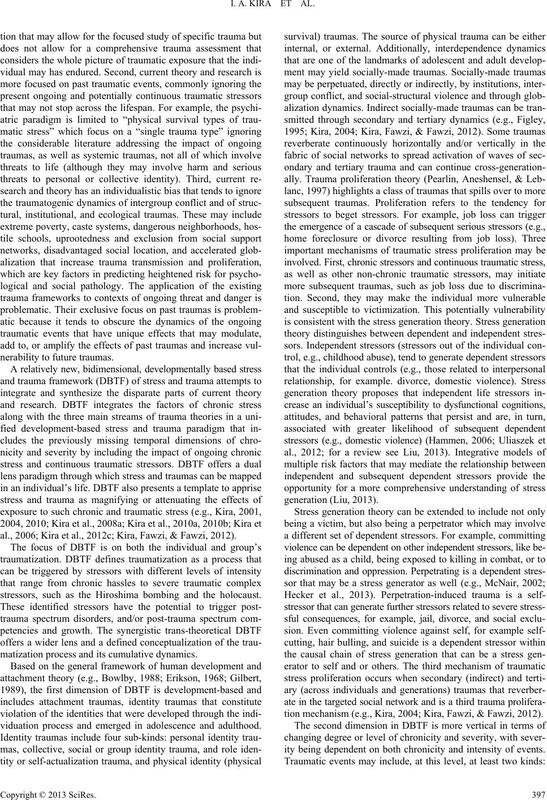 tity salience and related annihilation anxiety and not vice versa. sify the effects of such continuous traumatic stress. 7% (N = 30) as poor. were pilot tested in focus groups. violence. The measure had an alpha of .69 in the current data. .88, .92, .70, and .68 respectively in the current study. 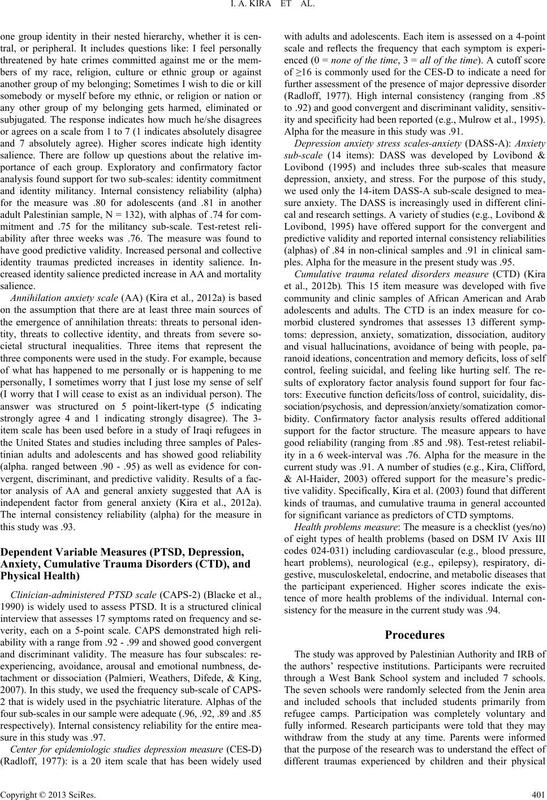 independent factor from general anxiety (Kira et al., 2012a). sure in this study was .97.
ity and specificity had been reported (e.g., Mulrow et al., 1995). Alpha for the measure in this study was .91.
ples. Alpha for the measure in the present study was .95.
for significant variance as predictors of CTD symptoms. sistency for the measure in the current study was .94.
through a West Bank School system and included 7 schools. field work was conducted from January to March 2005.
els had the best fit with data, regardless of our hypotheses. feltl apathetic with no emotions. 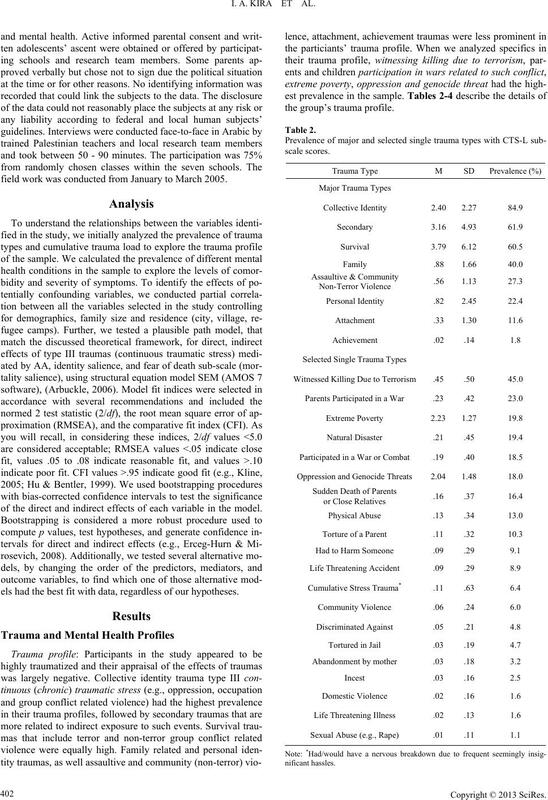 mulative stress traumas, had the highest associations with AA. des the associations for all of the variables. 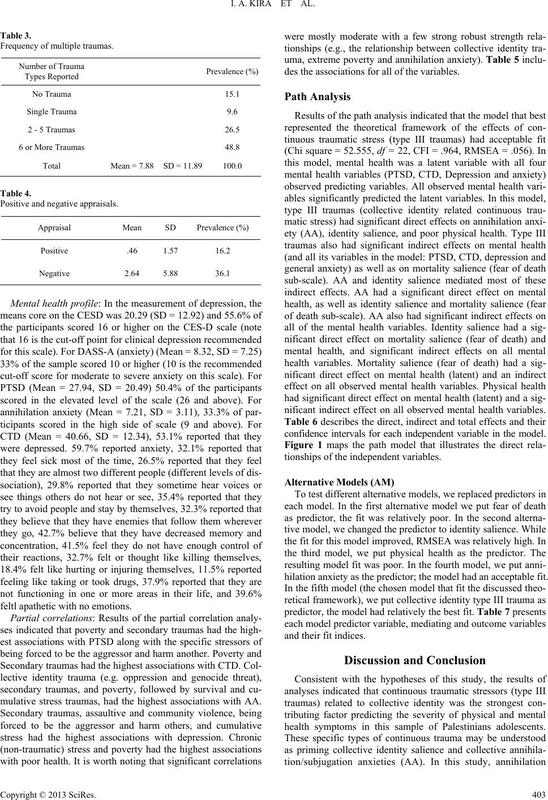 nificant indirect effect on all observed mental health variables. confidence intervals for each independent variable in the model. tionships of the independent variables. hilation anxiety as the predictor; the model had an acceptable fit. health symptoms in this sample of Palestinians adolescents. der, CTD = Cumulative Trauma Related Disorders. All paths are significant beyond .05. 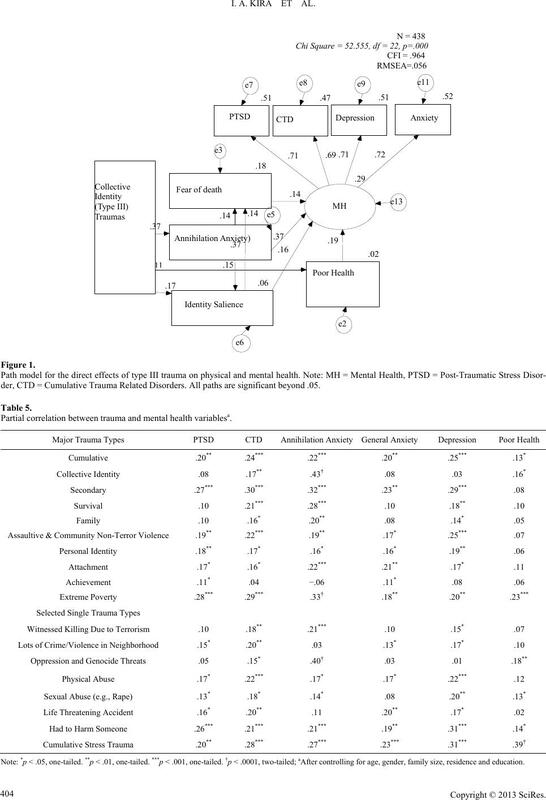 Partial correlation between trauma and mental health variablesa. ote: *p < .05, one-tailed. **p < .01, one-tailed. ***p < .001, one-tailed. †p < .0001, two-tailed; aAfter controlling for age, gender, family size, residence and education. 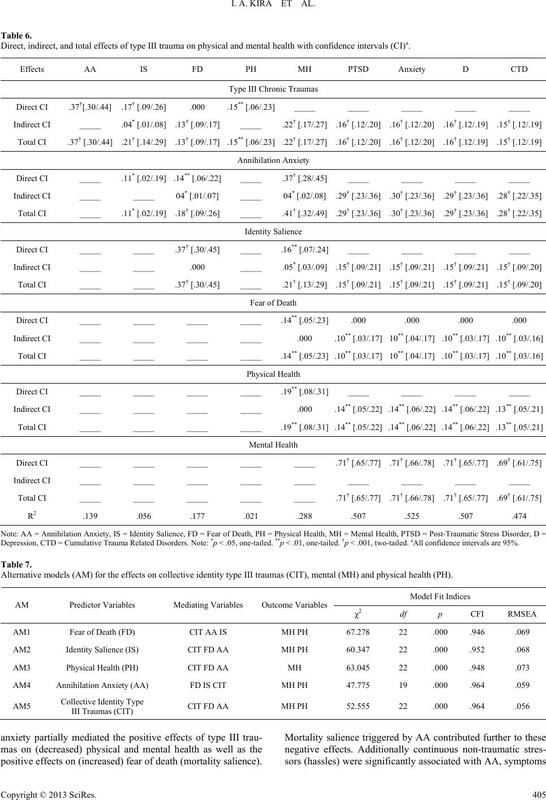 Direct, indirect, and total effects of type III trauma on physical and mental health with confidence intervals (CI)a.
Depression, CTD = Cumulative Trauma Related Disorders. Note: *p < .05, one-tailed. **p < .01, one-tailed. †p < .001, two-tailed. aAll confidence intervals are 95%. 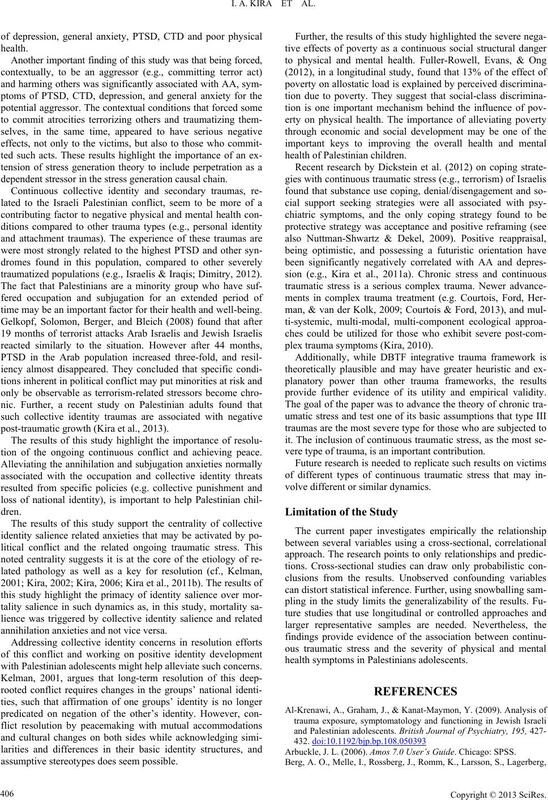 Alternative models (AM) for the effects on collective identity type III traumas (CIT), mental (MH) and physical health (PH). positive effects on (increased) fear of death (mortality salience). dependent stressor in the stress generation causal chain. traumatized populations (e.g., Israelis & Iraqis; Dimitry, 2012). time may be an important factor for their health and well-being. post-traumatic growth (Kira et al., 2013). tion of the ongoing continuous conflict and achieving peace. annihilation anxieties and not vice versa. with Palestinian adolescents might help alleviate such concerns. assumptive stereotypes does seem possible. plex trauma symptoms (Kira, 2010). provide further evidence of its utility and empirical validity. vere type of trauma, is an important contribution. volve different or similar dynamics. health symptoms in Palestinians adolescents. Arbuckle, J. L. (2006). A mos 7.0 User’s Guide. Chicago: SPSS. human development. New Work: Basic Books. Brody, G., Chen, Y., Kogan, S., Murry, V., Logan, P., & Luo, Z. (2008). Bryant-Davis, T., & Ocampo, C. (2005). Racist incident-based trauma. search. Personality & Social Psychology Review, 14, 55-195.
model. Social Science and Medicine, 45, 1715-1727.
research, and clinical a pp l ic at i ons. New York: Guilford Press. Journal and Cutting Edge of Social Policy Research, 4, 93-106.
the National Academy of Scie nc es , 1 09 , 5995-5999. Courtois, C. A., Ford, J. D., Herman, J. L., & van der Kolk, B. A. (2009). guide. New York: Guilford Press. sequenced, relationship-based approach. New York: Guilford Press. ma: Theory, Research, Practice, and Policy, 4, 392-399.
dren and adolescents in areas of armed conflict in the Middle East. Child: Care, Health and Development, 38, 153-161. Erikson, E. H. (1968). Identity, youth and crisis. New York: Norton. Flores, E., Tschann, J. M., Dimas, J. M., Pasch, L. A., & de Groat, C. L.
lescents. Journal o f Counseling Psychology, 57, 264-273.
abuse. Cambridge, MA: Harvard University Press. racial discrimination or do reports of discrimination predict health? ence & Medicine, 68, 1676-1684. Americans. American Jou rnal of Public Health, 97, 1275-1282. Arabs and Jews. Acta Psychiatr Scand, 117, 369-380. Survey. 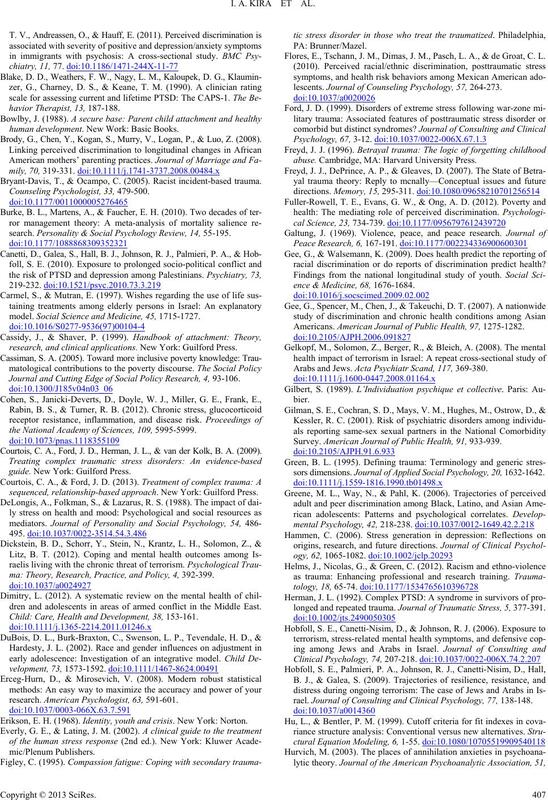 American Journal of Public Health, 91, 933-939.
sors dimensions. Journal of Applied Social Psychology, 20, 1632-1642.
longed and repeated trauma. 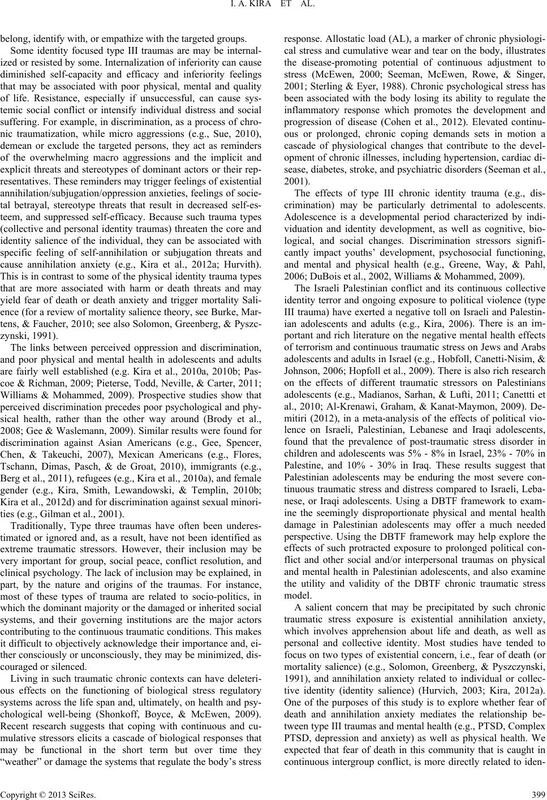 Journal of Traumatic Stress, 5, 377-391.
rael. 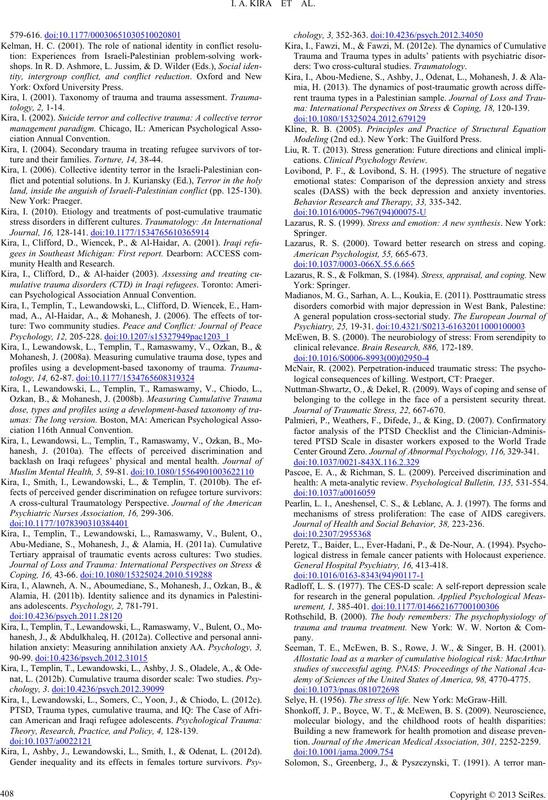 Journal of Consulting and Clinical Psychology, 77, 138-148.
ture and their families. Torture, 14, 38-44.
land, inside the anguish of Israeli-Palestinian conflict (pp. 125-130). can Psychological Association Annual Convention. Psychiatric Nurses Association, 16, 299-306.
ans adolescents. Psychology, 2, 781-791. Kira, I., Lewandowski, L., Somers, C., Yoon, J., & Chiodo, L. (2012c). Theory, Research, Pract i c e , and Policy, 4, 128-139. 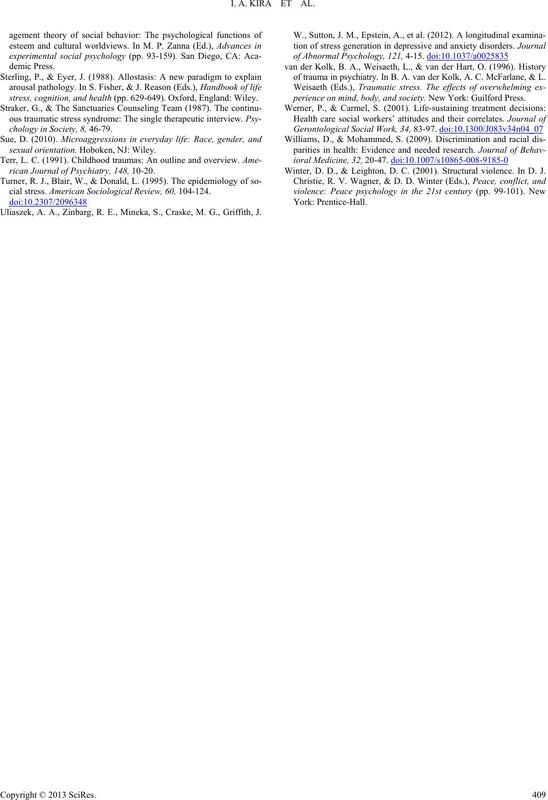 Kira, I., Ashby, J., Lewandowski, L., Smith, I., & Odenat, L. (2012d). ders: Two cross-cultural studies. Traumatology. ma: International Perspectives on S tr es s & Coping, 18, 120-139.
scales (DASS) with the beck depression and anxiety inventories. Behavior Research and Therapy, 33, 335-342. Lazarus, R. S. (2000). Toward better research on stress and coping. clinical relevance. Brain Research, 886, 172-189.
logical consequences of killing. Westport, CT: Praeger. belonging to the college in the face of a persistent security threat. 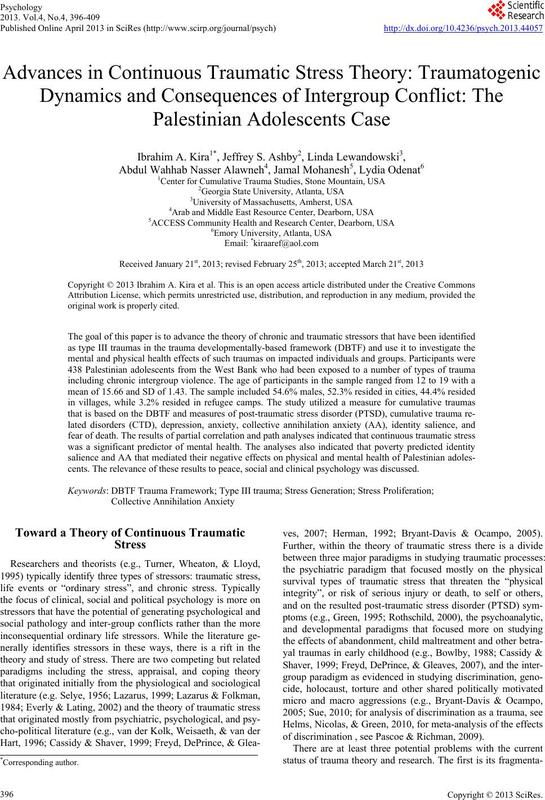 Journal of Traumatic Str e s s, 22, 667-670. Center Ground Zero. 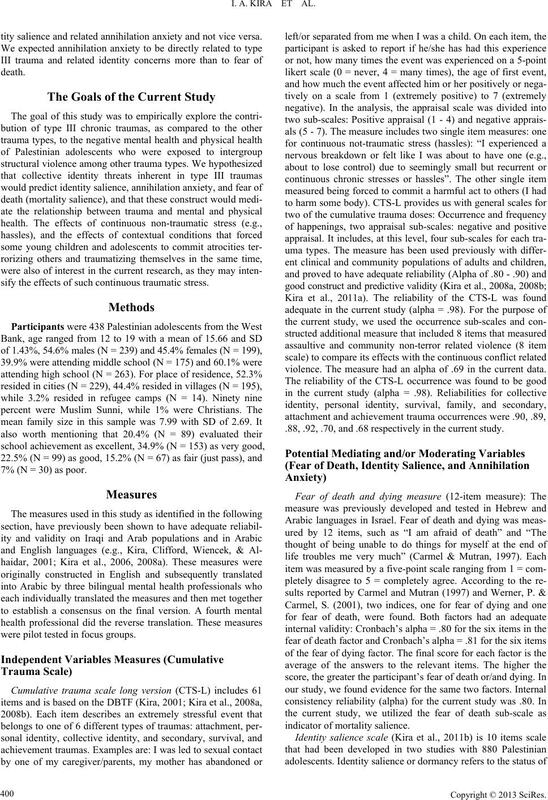 Journal of Abnormal Psychology, 116, 329-341.
health: A meta-analytic review. Psychological Bulletin, 135, 531-554.
mechanisms of stress proliferation: The case of AIDS caregivers. Journal of Health and Social Behavior, 38, 223-236.
logical distress in female cancer patients with Holocaust experience. General Hospital Psychiatry, 16, 413-418. Seeman, T. E., McEwen, B. S., Rowe, J. W., & Singer, B. H. (2001). demy of Sciences of the United States of America, 98, 4770-4775.
tion. Journal of the American Medical Association, 301, 2252-2259.
stress, cognition, and he al th (pp. 629-649). Oxford, England: Wiley. chology in Society, 8, 46-79.
sexual orientation. Hoboken, NJ: Wiley. rican Journal of Psychiatry, 148, 10-20.
cial stress. American So ci o logical Review, 60, 104-124. Uliaszek, A. A., Zinbarg, R. E., Mineka, S., Craske, M. G., Griffith, J.
of trauma in psychiatry. In B. A. van der Kolk, A. C. McFarlane, & L.
perience on mind, body, and so c i et y . New York: Guilford Press. Winter, D. D., & Leighton, D. C. (2001). Structural violence. In D. J.